New Year's Eve: DJ/Karaoke at the Sweet Shoppe! Home » Home » Blog » NYE: DJ/Karaoke at the Sweet Shoppe! NYE: DJ/Karaoke at the Sweet Shoppe! 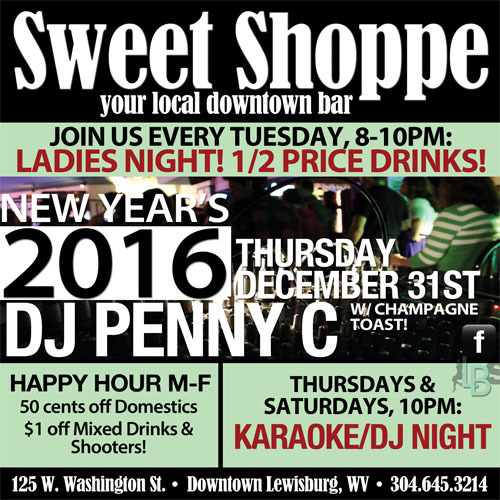 Have a blast w/ dj/karaoke while you’re ringing in the new year at the Sweet Shoppe, located in downtown Lewisburg, WV! Complimentary champagne toast! Also, check out Ladies Night every Tuesday, 8-10pm. Ladies get 1/2 price drinks!! !